research effort has risen by a factor of 18 since 1971. This increase occurs while the growth rate of chip density is more or less stable: the constant exponential growth implied by Moore’s Law has been achieved only by a massive increase in the amount of resources devoted to pushing the frontier forward. Assuming a constant growth rate for Moore’s Law, the implication is that research productivity has fallen by this same factor of 18, an average rate of 6.8 percent per year. If the null hypothesis of constant research productivity were correct, the growth rate underlying Moore’s Law should have increased by a factor of 18 as well. Instead, it was remarkably stable. Put differently, because of declining research productivity, it is around 18 times harder today to generate the exponential growth behind Moore’s Law than it was in 1971. Below the fold, some commentary on this and other relevant research. Actually, of course, in recent years Moore's Law has slowed as the technology gets closer and closer to the physical limits. This slowing increases the rate at which research productivity falls. Taking the aggregate economy number as a representative example, research productivity declines at an average rate of 5.3 percent per year, meaning that it takes around 13 years for research productivity to fall by half. Or put another way, the economy has to double its research efforts every 13 years just to maintain the same overall rate of economic growth. The annual rate of change in US R&D expenditure is shown in the graph above. It was below 5.3% for 8 of the 17 years before 2016. It is therefore likely that inadequate R&D expenditure was a significant contributor to the approximate halving of the rate of growth of US GDP over the same period. Research productivity for semiconductors falls so rapidly, not because that sector has the sharpest diminishing returns — the opposite is true. It is instead because research in that sector is growing more rapidly than in any other part of the economy, pushing research productivity down. A plausible explanation for the rapid research growth in this sector is the “general purpose” nature of information technology. Demand for better computer chips is growing so fast that it is worth suffering the declines in research productivity there in order to achieve the gains associated with Moore’s Law. Or even the smaller gains associated with growth significantly slower than Moore's Law. Industry projections for the Kryder rate of both SSDs and HDDs depend heavily on rapid progress in density, i.e. on the products of R&D investment. Flash is a very competitive market, and although hard disk is down to 2.5 manufacturers, which might suggest improving margins, hard disks are under sustained margin pressure from flash. Thus falling research productivity has a particular impact on the future of storage, because neither the SSD nor the HDD markets can sustain the large increases in R&D spending needed to increase, or even sustain, their Kryder rates. Bloom et al bolsters the case for low and falling Kryder rates. The only reason models with declining research productivity can sustain exponential growth in living standards is because of the key insight from [endogenous growth theory]: ideas are nonrival. And if research productivity were constant, sustained growth would actually not require that ideas be nonrival; Akcigit, Celik and Greenwood show that fully rivalrous ideas in a model with perfect competition can generate sustained exponential growth in this case. Our paper therefore clarifies that the fundamental contribution of endogenous growth theory is not that research productivity is constant or that subsidies to research can necessarily raise growth. Rather it is that ideas are different from all other goods in that they do not get depleted when used by more and more people. Exponential growth in research leads to exponential growth in [research expenditure]. And because of nonrivalry, this leads to exponential growth in per capita income. It is a strong argument for open source and open science. Tyler Cowen writes about cost disease. ... Cowen seems to use it indiscriminately to refer to increasing costs in general – which I guess is fine, goodness knows we need a word for that. There was some argument about the style of this graph, but as per Politifact the basic claim is true. Per student spending has increased about 2.5x in the past forty years even after adjusting for inflation. Inflation-adjusted cost of a university education was something like $2000/year in 1980. Now it’s closer to $20,000/year. No, it’s not because of decreased government funding, and there are similar trajectories for public and private schools. I don’t know if there’s an equivalent of “test scores” measuring how well colleges perform, so just use your best judgment. Do you think that modern colleges provide $18,000/year greater value than colleges did in your parents’ day? Would you rather graduate from a modern college, or graduate from a college more like the one your parents went to, plus get a check for $72,000? I worry that people don’t appreciate how weird this is. I didn’t appreciate it for a long time. I guess I just figured that Grandpa used to talk about how back in his day movie tickets only cost a nickel; that was just the way of the world. But all of the numbers above are inflation-adjusted. These things have dectupled in cost even after you adjust for movies costing a nickel in Grandpa’s day. They have really, genuinely dectupled in cost, no economic trickery involved. And this is especially strange because we expect that improving technology and globalization ought to cut costs. Patients can now schedule their appointments online; doctors can send prescriptions through the fax, pharmacies can keep track of medication histories on centralized computer systems that interface with the cloud, nurses get automatic reminders when they’re giving two drugs with a potential interaction, insurance companies accept payment through credit cards – and all of this costs ten times as much as it did in the days of punch cards and secretaries who did calculations by hand. Note that R&D is also a human-intensive business that should have reaped significant cost savings from technology and globalization. But like these other fields, it has increased massively in price. In fact, 18-fold instead of 10-fold. Cowen and Alexander are on to a really significant problem for the economy as a whole. Have you come across "Do the Math"? It is (was?) a blog (https://dothemath.ucsd.edu) by a UCSD physicist (Tom Murphy), about sustainable energy, or at least how to reduce the exponential growth in energy consumption. He hasn't posted for a long time, but something in what you wrote reminded me of his starting premise, which is that in a finite world exponential growth in resource consumption is impossible. OK, it's a very different case, but there seem some parallels. The Moore's Law issue should remind us that many of these "exponentials" are really the bottom part of an S curve, limited as we bump up against natural barriers. So as you get towards the top part of the S curve it shouldn't be surprising if research productivity drops off, even 18-fold. But surely the effect will be field-specific, related to the actual hard limits, so it's not appropriate to transfer the loss of research productivity from on (measurable) field to another? 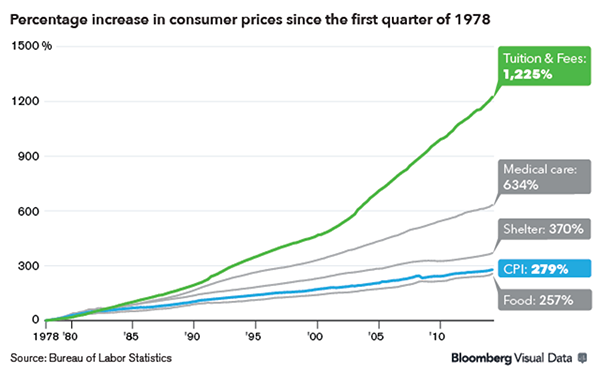 As to health care costs, it does bug me how much costs have risen. 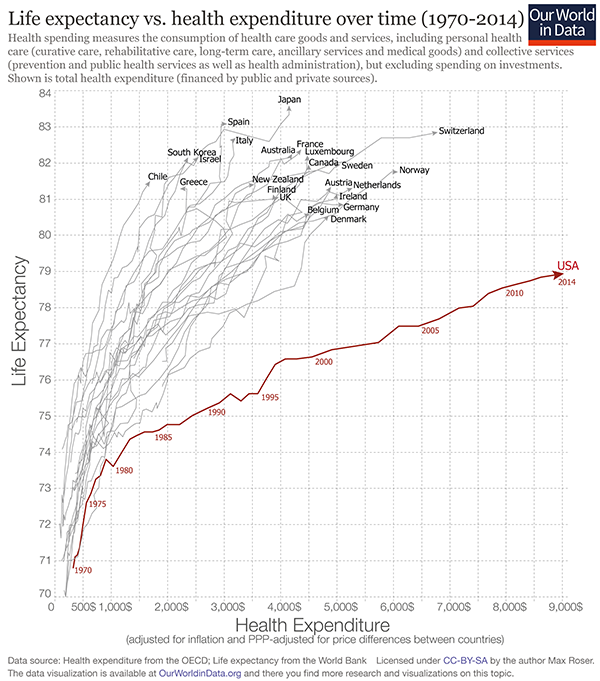 You will no doubt be aware of the many crises afflicting our health care in the UK, and it appears US health care is not immune (and an even higher proportion of GDP). Annoyingly we see a lot of articles about costs through over use of A&E, bed blocking because of lack of social care to move older people out of hospital, and other articles hammering the government about lack of funding (to which the government irrelevantly replies that they have increased funding). But I don't see analyses of where the cost pressures are coming from. There have been many rounds of hospital closures and mergers, and other "efficiencies" so you'd think things would get better, but they seem to get worse. I would guess there are at least 3 other factors. One is that the endless rounds of "reforms" have greatly increased the "managerial" cost of the NHS, so that a decreasing proportion of staffing effort is directly involved in healthcare. Another (I guess) is price gouging by pharmaceutical companies (perhaps I should say profit maximisation rather than price gouging!). And the third would be the increasing use of very high cost health technologies, like proton beam scanners etc. These simply weren't available in the past, but are now (presumably with concomitant improvements in health outcomes), so you'd expect above-inflation cost increases to pay for them. There are efficiencies as you describe (electronic booking etc), but the NHS is slow to turn, and much stuff still happens the other way. My daughter works in healthcare on two sites; they don't have an electronic health record system, and frequently the paper records end up on the wrong site. Sometimes she drives to the other site to get them, sometimes they are sent in a taxi. Seems daft, but if you are as risk-averse as the NHS, perhaps not so surprising! Lost the text of your piece, an annoying Blogger feature, but I think those are the points I wanted to make! "The economists are concerned primarily with what I would call applied science, the kind that fuels economic growth and increases wealth, health and living standards. Advances in medicine, transportation, agriculture, communication, manufacturing and so on. But their findings resonate with my claim in The End of Science that “pure” science—the effort simply to understand rather than manipulate nature--is bumping into limits. And in fact I was invited to The Session because an organizer had read my gloomy tract, which was recently republished." "My last post, “Is Science Hitting a Wall?,” provoked lots of reactions. Some readers sent me other writings about diminishing returns from research. One is “Diagnosing the decline in pharmaceutical R&D efficiency,” published in Nature Reviews Drug Discovery in 2012. The paper is so clever, loaded with ideas and relevant to science as a whole that I’m summarizing its main points here." 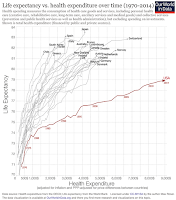 "the number of new drugs approved per billion U.S. dollars spent on R&D has halved roughly every 9 years since 1950." Kelvin Stott's 2-part series Pharma's broken business model: Part 1: An industry on the brink of terminal decline and Part 2: Scraping the barrel in drug discovery uses a simple economic model to show that the Internal Rate of Return (IRR) of Pharma companies is already less than their cost of capital, and will become negative in 2020. Stott shows that this is a consequence of the Law of Diminishing Returns; because the most promising research avenues (i.e. the ones promising the greatest return) are pursued first, the returns on a research dollar decrease with time.